Hello Lovelies! This post is a companion post/review to my niece's Pammy Blogs Beauty Totally Teen feature that recently published on my blog. If you missed that post, please check it out here: Totally Teen: Makeup and Beauty Items from SFRbeauty. Like Mollee, I also had a chance to try out some really great items from the Purely Pro Cosmetics line available at SFRbeauty! 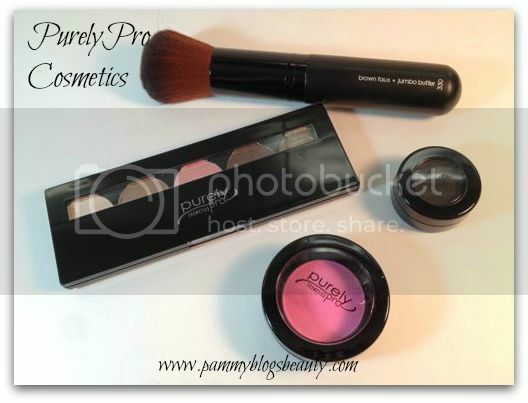 For this review, I tested out PurelyPro's Blush, 5-Well Eyeshadow Palette, and Vegan Buffer Brush. No, lol, my eyes are not hazel. :) While this palette is designed for gorgeous hazel eyes, the neutral shades would look great with any eye color! Actually, I found that these shades looked lovely with my light blue eyes. I just adore the color selection in this palette. It contains (from left to right) a buttery vanilla, a light neutral cool toned brown, a soft pink, a deep chocolate brown with the slightest hint of shimmery eggplant, and a deep army green. All of the shadows have a subtle almost-metallic shimmer. The shadows are all richly pigmented with a soft and blend able texture. I am super happy with this palette! 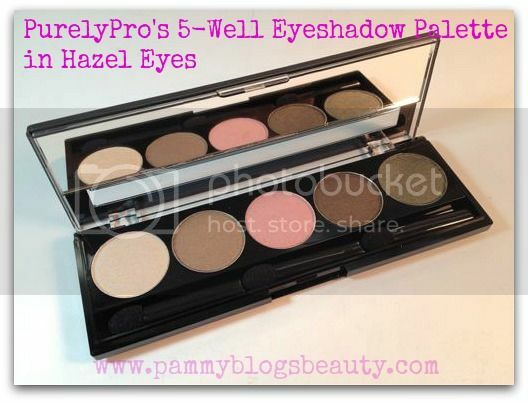 PurelyPro has 15 different 5-Well Eyeshadow Palettes. Each palette contains 5 coordinated eye shadows. Each palette retails for $56.99. Now ya'll know how I adore blush!!! 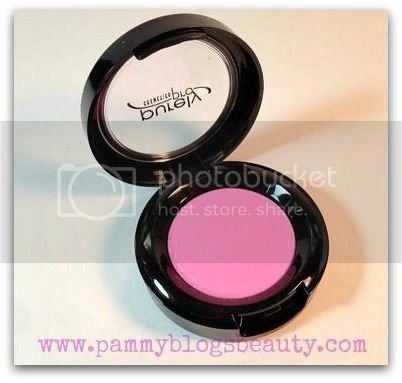 :) This beautiful bright pink blush by PurelyPro is exactly the type of shade that I love to wear!!! "Universal" is a richly pigmented matte bright "Barbie" pink. It is a lovely pop of color on my fair skin. I just love it! The packaging is simple and chic: just a black round compact with a clear lid. I can't get over how amazingly soft this brush is!!! It is essentially a long handled compact kabuki. 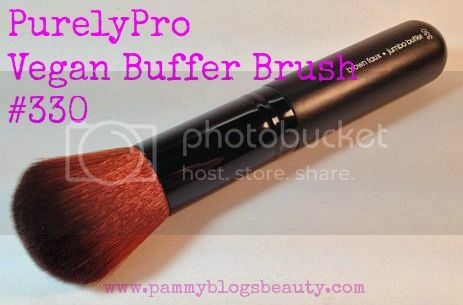 You can use it to apply powder foundation/mineral foundation, bronzer, or blush. I like to use it for bronzer and blush. The brush hairs are synthetic and vegan. It washes well and is of really nice quality! I really love the soft feel of this brush on my face. The brushes in the Purely Pro line are totally worth exploring! Retails for $40.99. Have you tried anything from this line? I am hoping to explore this line further in the future!